What are Checklist Steps (Check Steps)? When creating your checklists, the checks are organized into categories that correspond with a feature or area of your apparatus or equipment. The categories contain the Check Steps, which are the specific aspects that need to be reviewed during the check. You can put multiple different kinds of Check Steps within the same Category. Rearrange Categories or Check Steps by dragging and dropping to the new location. Note - checks can only be rearranged from within the same category. Pass/Fail checklist steps give the ability to pass or fail an inspection step. Utilize the Mapped Ticket Type option to autogenerate a work order when this step is marked as Failed during the check. Equipment checklist steps allow you to get an accurate accounting of where equipment has been seen. While performing the check, select an equipment pool and item from the items listed in your inventory. 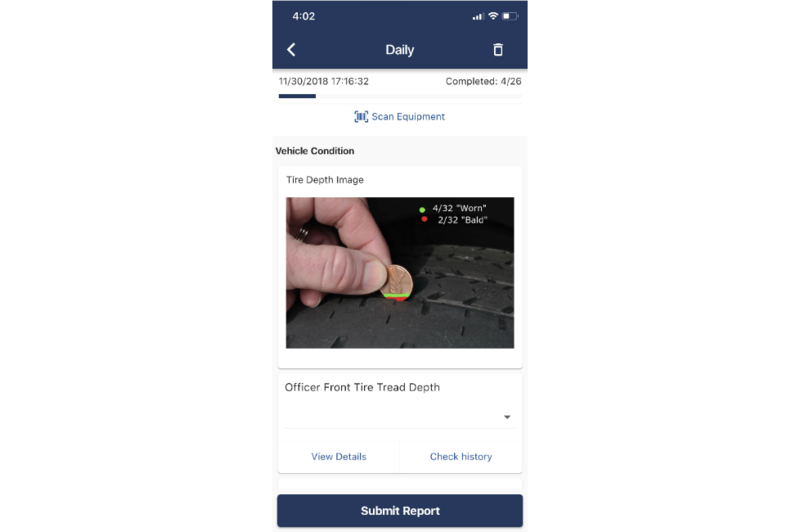 Upon submitting the report, it will assign all equipment inspected to that truck and record an event in the Item Log. *Note* In order to add am Equipment check to a report, you first must add equipment. Floating Equipment - Equipment such as SCBA bottles might float between trucks and stations. 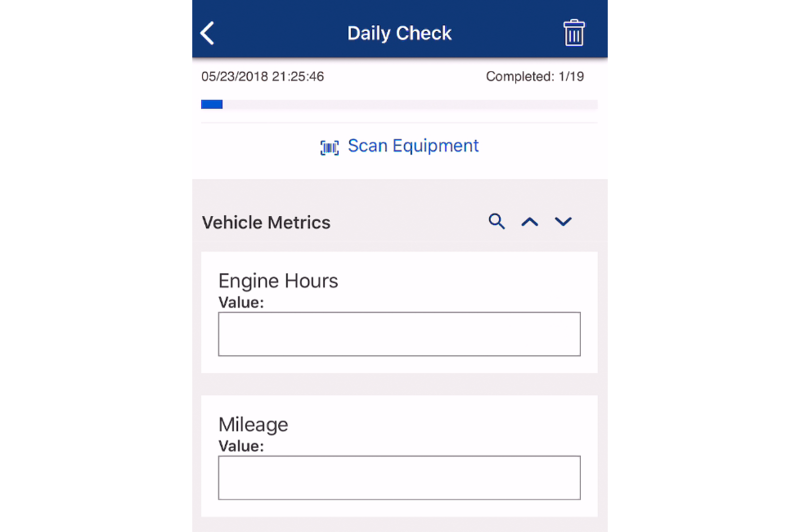 When you are creating the Check Step, leave the Equipment Item dropdown blank to allow users to select which specific equipment item they have encountered and on this truck and are inspecting during the time of the check report. Assigned Equipment - Equipment such as cutters and spreaders and ladders are assigned to a single truck. When configuring checks for these items, select the specific equipment item from the Equipment Item dropdown. When completing a report users will not have the option to select an alternative equipment item. Floating Equipment: Choose the specific item manually from a list or by scanning its barcode. Assigned Equipment: Specific item will already be listed in the check description. Numeric Checklist steps are used to collect and report numbers, usually in the form of gauge readings like mileage and pump hours. When you select to add a Numeric Check Step, a drop down with several common numeric options will aper. You can choose to use one of the pre-populated options, or type in the title box and tap Enter on your keyboard to save your custom check name. Utilizing the numeric Check Steps labeled Engine Hours, Pump Hours, and Mileage as are especially beneficial because these Meter Readings have additional reporting tied to them. Type numeric values into the provided fields. Select check steps allow users to select an option from a dropdown like Fluid Levels: 1/4, 1/2, 3/4, or Full. Upon choosing the Select Check, click Manage Select Steps to create new, and edit existing Select check steps. Once set up, the Select check steps can be used in checklists department-wide. Include text or images in an Instruction check step to help users complete the truck checks. The Comment field gives users the opportunity to add additional comments inline while completing the checklist. Give the check step a title or comment prompt. The comment field will appear during checklist completion. Capture a signature in the checklist. Give the check a title when adding it to the checklist. A signature box is provided at the time of checklist completion. Build out compartments within your Inventory to keep track of small hand tools, perishables, consumables and anything else that is not being tracked as Equipment. 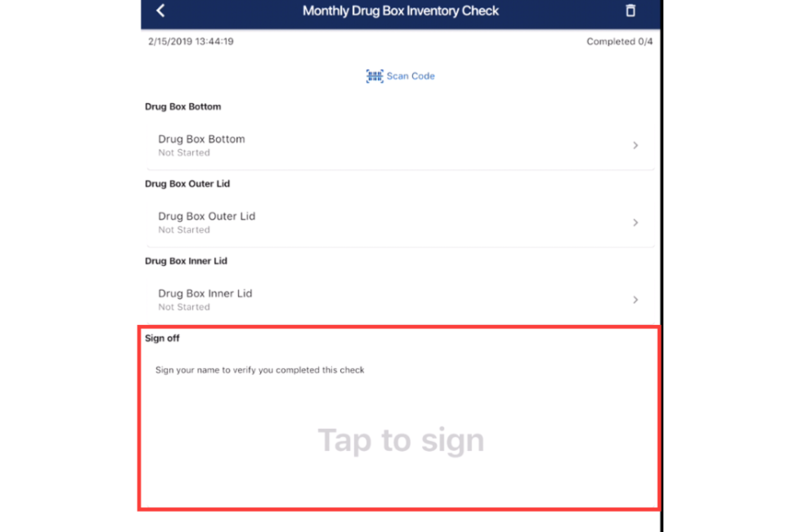 Include a Compartment Check Step so that users can review item quantities, expirations, etc that are detailed in Inventory. Before adding a Compartment Check to your checklist you must create your compartment and itemize what should be present. To do this, visit the Inventory tab in the left menu and select Compartments. Once this is complete, you can select the compartment to check.